What a great Thanksgiving holiday! We left Glenville on Wednesday and headed north. We first had to go to our "hair specialist" in Shinnston and get beautified. (Regina was the one that changed my 70's hairdo and labeled her creation the "Stud Muffin" cut. With a name like that, I had to stick with this haircut.) Regina Colton has her own shop now on Main Street. She has been cutting our hair for many years and is most certainly part of our extended family. We arrived at the Dodson house before John, Rachael, Flora, and Lucy. We had a quick visit with them before we headed to bed. Thursday morning brother-in-law Bill, sister Judy, and Grandma Great Meads came to share this special family time. We are so blessed to have family closeby. The grandkids had some quality time before the cooking started. Here is the gourmet kitchen crew! I knew you would enjoy Sarah's turkey apron. What a feed! Yep we had hominy casserole, turkey, dressing, salad, mashed potatoes, squash stuffed ravioli, green beans, apricot sauce, rosemary bread, cooked apples, plus appetizers and desserts. It is always enough to feed all the folks on the street. Today is Lucy's first birthday so had a one-year sized cake on Thursday. Here is Grandma's gift - an electronic toy that is geared to learning shapes. It is so neat to watch the kids play together. What energy! Sam discovered that the cabinet that usually houses the trash was empty. Notice that all of the cabinets have the kid-proof locks to keep out little prying hands. Flora and Lucy had to check out this fun cavity. Later in the evening, Flora came into the living room and said "Lucy has locked herself into the cabinet!" Well, we all knew that these security locks can only be fastened from the outside. It was time to extract Lucy and then have a "truth" lesson with Flora. Yesterday was Black Friday. Sarah and I thought that we would get up at 4 AM to just have this experience once in our lives. I have heard crazy stories about the shoppers and their insanity during this day. We did not get up at 4 AM, but Sarah and I decided we needed to do a few chores and left the house around 8:30. The stories were true. Starbucks normally open at 6 AM but on this day they opened at 4 AM. The personnel at this famed coffee establishment said that people were waiting at 3 AM to get in line for coffee. We stopped by Kohl's and found that, after we went into the store, the wait time for checkout was 2 hours! We left. Off to the mall. I needed a cover for our new cell phone. This area was equally crazy. People parking in places that were unbelievable. My favorite story was the happening at Circuit City. Shoppers camped out around the store starting around 8 PM on Thursday. Seems the police had to be called to the store to break up a fist fight between shoppers. Oh, what a great season for peace and sharing! A Busy Week Before The Thanksgiving Holidays! Well, what a week! 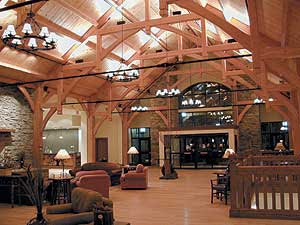 We attended the Create WV Conference held at Stonewall Jackson Resort on Tuesday and Wednesday. One of our Gilmer High School graduates as well as WV University, Jeff James, conducted the conference. It was exceptional. You may wish to check out the website. The last of the week has also been equally as busy. Folk Festival meetings and baking were on the agenda. When I got out of bed yesterday morning, I noticed the ole radar screen indicating that we may get some snow. I was excited, but, durn, only saw maybe three small snowflakes the entire day! One of the joys of retirement is that when it snows one can return to the cozy bed. Hurray, we do not have to wade through the snow to the place of employment ever again. The folks in the mountains at Canaan and Snowshoe did get 4 to 5 inches. One of the crazy things is the color of the trees this fall. I believe the Forest Service is taking lessons from our friends at the weather forecast centers. I have often said that meterology is one of those professions where one can be consistently wrong in the forecast and still have a job. Earlier in the summer, the Forest Service indicated that the foliage this fall would probably be drab and turn brown quickly because of the drought and warm temperatures. Low and behold it has been a glorious season for fall colors. Note the photos below of the Burning Bush and the Japanese Maple in our backyard. Even in mid-November, they are displaying wonderful color. I listened to the news today and the Forest Service said that the brillant colors are due to the drought and warm temperatures. GO FIGURE! I did mention that I completed some serious baking. Yesterday, I baked a couple of loaves of Amish Friendship Bread. Tonight I finished four loaves of rosemary French bread. These loaves - seen below- will be added to the gourmet fare serviced on Thanksgiving by daughter Sarah. Best I retire for the evening. Sunday school calls at 10 A.M. You folks have a great Sunday! Great Grandma Mary Louise Benton Musgrave celebrated her 88th birthday this past Saturday. (Remember our granddaughter Flora calls her - "Grandma Great In The Big Chair"!) We invited in all the Benton relatives and friends to celebrate this benchmark. Judy supplied the turkey, ham, meatballs, and mashed potatoes while everyone else brought a covered dish. I made the bread! The food was so plentiful and yummy! You can see that brother-in-law Bill is sampling the fare in order to assure quality control. Here is Mary Louise with her only living brother, Jack Benton, who will be 80 next year. Rachael, John, Flora, and Lucy came to the party along with John's Mom and Dad, Jane and Jim Meeker. Jane and Jim live in Arizona and were visiting the kids in Shepherdstown last week. We had around thirty folks attending this celebration. Here are Karen and Uncle Gene who lives in Parkersburg. Karen is one of Uncle Gene and Aunt Ethel's three daughters and works as a principal at an elementary school in Charleston. Where was Aunt Ethel? Oh, I forgot, I was cuddling with her by the pond! I am certain that her good husband of 60 years would not mind. Ethel is Grandma Great's sister-in-law. Speaking of cuddling, Sherel and Marshall were also in their cuddling mood. We had a great time sharing "Grandma Great In The Big Chair"'s 88th birthday. We can not forget the other Grandma Great! Grandma Meads rode over with Bill and Judy. It is such a joy seeing her healthy and able to enjoy life at age 83. When we left Shepherdstown last Thursday, Miss Flora came back to Glenville with us. We had a good time for the next 5 days visiting with this special gal. On Saturday Grandma decided that it was such a great fall day that needed a picnic at Cedar Creek State Park. Flora helped distibute the gourmet fare. Peanut butter sandwiches and chocolate milk were on the menu (yummy). Grandpa and Flora went on a fishing adventure. The adventure did not last long. We succeeded in drowning one worm! We finished up the Cedar Creek experience by testing out the playground equipment. This small stone house was built on the campus of Shepherd University in 1929. It is fully furnished and even has a minature staircase going to the second floor. Even Flora looks like an big gal in front of this stone house. Oh, what an experience to be Trick or Treating on German Street in Shepherdstown! The merchants were at their shops giving out goodies to all the wonderfully costumed kids. The street was packed with hundreds of folks celebrating Halloween. Here are a couple examples of the merchants in their costumes as they supplied the kids with treats. This cow above was "utterly" fastastic. A common theme this evening seemed to be focused around the movie "Pirates of the Caribbean". From the Pirates of the Caribbean, here is a lad dressed as Davy Jones. The back of his head was definitely the body of an octopus. I loved this lad dressed as Harry Potter! This real puppet was complete with strings! Here is Flora's neighbor, Harper, in his lion attire. What a cutie! Looks as if Flora has a preference for masked men. Oh, what a fun time watching all the kids!